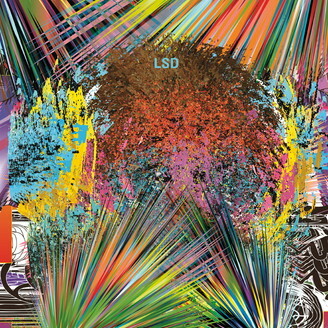 LSD is an ongoing musical collaboration between longtime electronic music innovators Luke Slater, Steve Bicknell and David Sumner focusing on psychedelic aspects of techno while emphasizing the cross-pollination of each member’s style and rhythmic sensibility. Personal ties between the three can be traced back across continents and developments in dance music, with Steve first inviting Luke to play his legendary LOST party series in London in the early 90s, resulting in mutual remixes for pioneering techno imprints Cosmic Records and Nova Mute. Almost a decade later in the year 2000, Dave, a native New Yorker, befriended Steve after inviting him to play Limelight in Manhattan. Over the years, Dave and Luke would also have numerous encounters, first forming a musical bond in 2009, with Dave later co-producing Luke’s early L.B. Dub Corp material (“Roller”, 2013). The seed for LSD was planted later during a mutual gig at the Moulin Rouge, Paris in July 2015 in support of Function’s Berghain 07 mix. There the trio exchanged thoughts on a collaboration that would blur the line between DJing and live performance, with each member manipulating separate elements and tracks to unpredictably construct and deconstruct the whole. Originally planned as a one-off closing set at Berghain on July 17, 2016, the trio has since decided to continue developing their brand of lysergic machine music with their first 3-track 12”. “Process 1” slams in hard without a come-up, immediately introducing overdriven and multilayered kicks and hats, while a squelching synth-line writhes between distant sirens before the rhythm is stripped down piece-by-piece. “Process 2” picks up at a similar pace within a tunnel of high-pitched drones and warning signals panning across the stereo image. Syncopated hats and filters open and close before eventually reaching full dilation. On “Process 3”, a more spacious sonic landscape is soon filled with the bleeping sounds of emergency before veering off into more subdued territory. There, dueling synth arpeggios eventually pick the pace back up before a long, slow fade initiates a comedown. As a whole, Process accentuates hallucinatory and shapeshifting sonic elements without focusing on the broader notion of the trip. Instead, Luke, Steve and Dave offer their take on the strobing intensity of the peak psychedelic experience – one interspersed with moments of hypnotic and atonal melody, as forward-moving as it is entrancing.